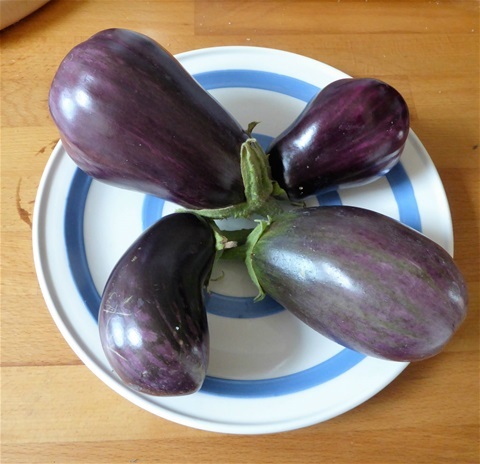 A good harvest this week! 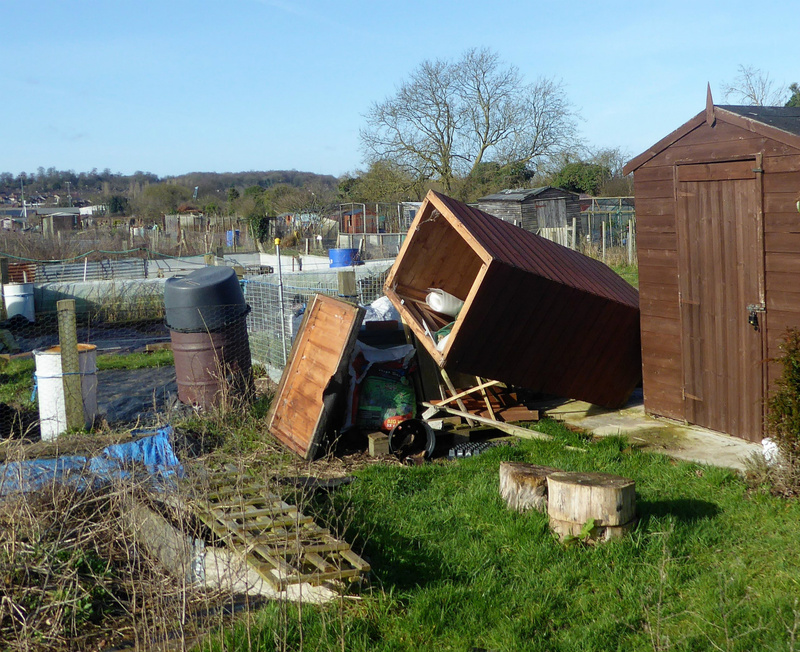 27th February: Doris at the allotment! Remember that lovely new cloche I put up last week, the one I was so proud of? Gone!! When we turned up at the plots on Wednesday morning it was nowhere to be seen. 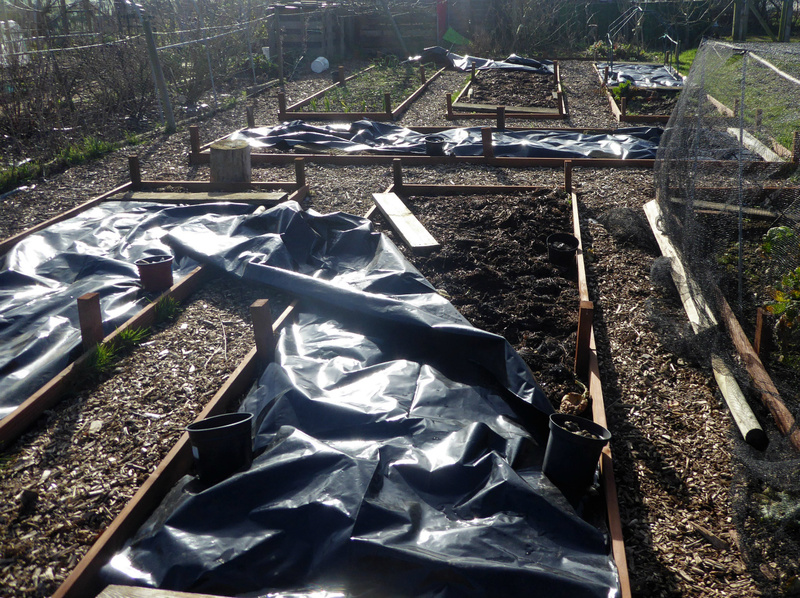 The storm damage didn't stop there either.. the cover of our old faithful mini-tunnel was badly torn, the small shed on #146 had been up-ended, empty dalek compost bins and water butts were all over the place and some of the black plastic covers on the beds were flapping madly. The mini-tunnel is six years old and the cover has been igardually wearing out, so its demise was not really unexpected. 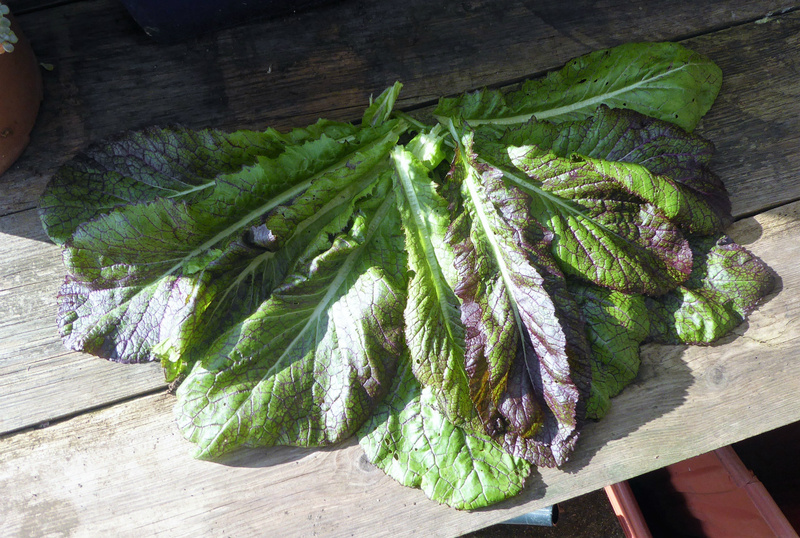 I trimmed what was left to stop it flapping about noisily, and the mustard, lettuce and pak choi growing there will still benefit from some shelter from the remaining sides. It didn't take too long to put the black plastic covers straight and tidy up the escaped bins. The cover of the new cloche turned up wrapped around some bushes further along, and amzingly it was in one piece. The frame was easily reassembled, the cover replaced and then it was business as usual, thank goodness! 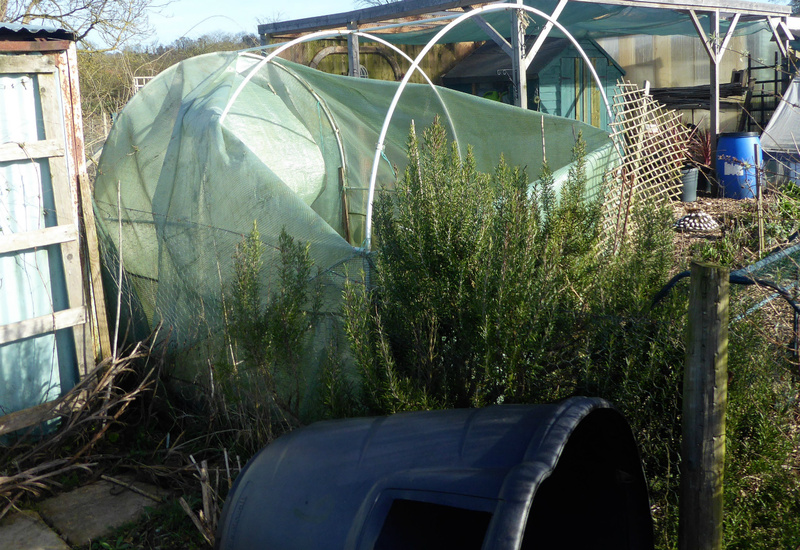 The damage did however sharpen our minds about the new polytunnels. 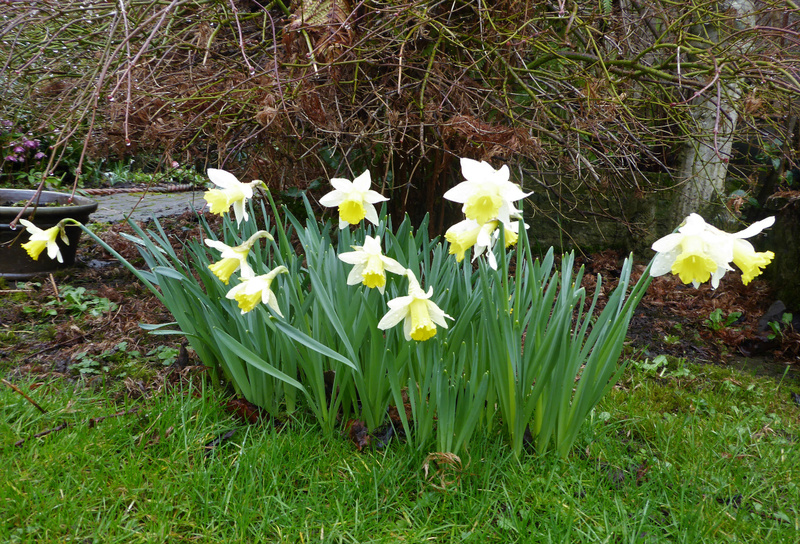 Our plot neighbour has two, which were unscaathed by the storm, which is heartening as we are planning to buy the same model! 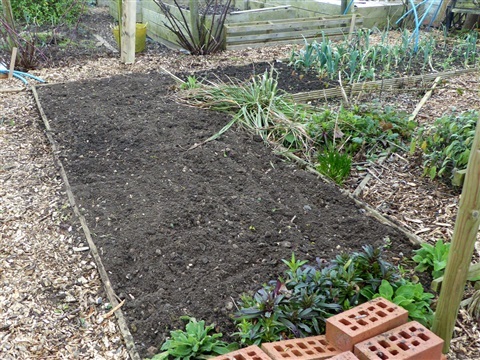 The ground was measured out accurately to accommodate the two new tunnels and the 8th veg bed, and then the hard graft began of digging out that bed from the solid grass and weed covered ground. This section took over an hour to excavate! Rain stopped play today, but tomorrow may be drier weather... no prizes as to guessing what we shall be doing! This year the carrots will be going into the adjoining bed, which still has some leeks in it, so I need to make sure I start using these up fairly soon. 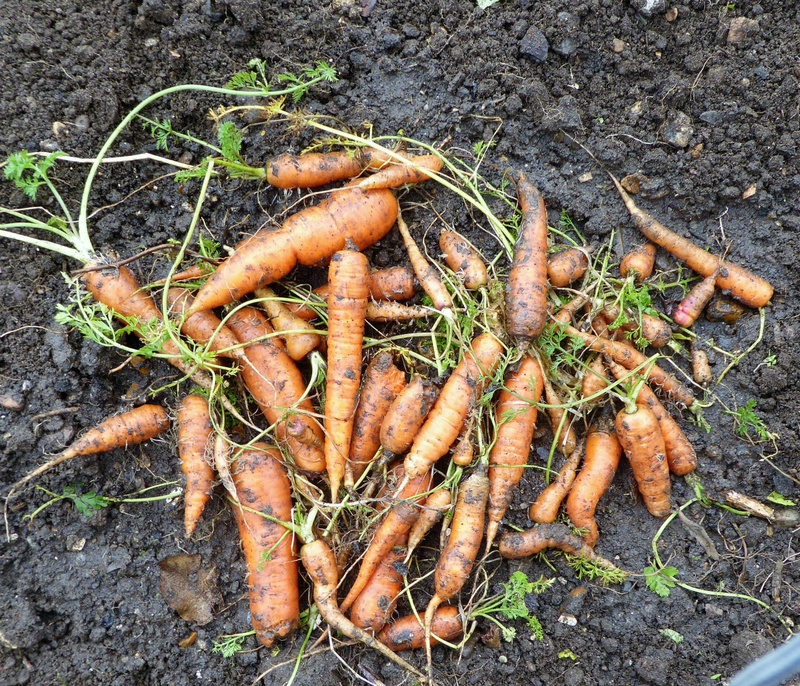 The ones I dug up yesterday were a bit on the small size (I don't think I fed them enough: leeks are greedy plants) but did not have leek moth damage. 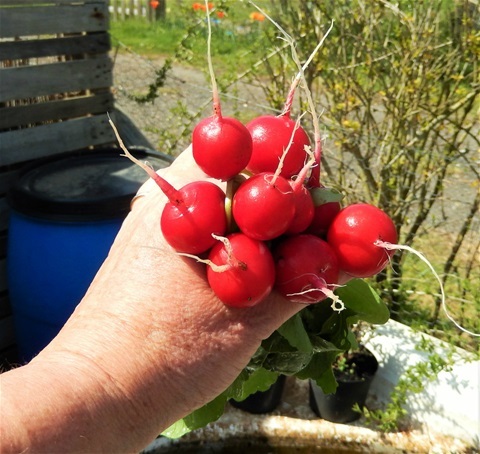 They tasted good with our roast chicken, along with carrots, parsnips, sprouts and the first of the Purple Sprouting Broccoli and potatoes from our stores. To be honest, the last of the potatoes are now sprouting and are mainly quite small, so I can see they will not last much longer. I had planned to put the last of them in the fridge to keep them a bit longer, but at that size it is not really worth it. 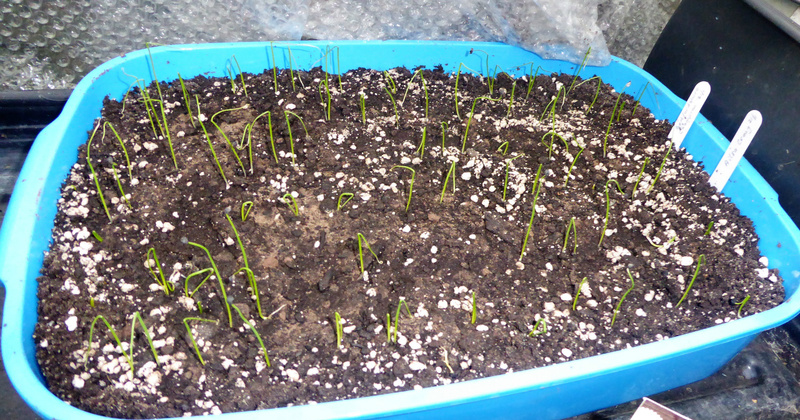 The last few onions are starting to sprout too. Never mind, we have not had to buy either potatoes or onions since last May, so we should just be glad of that. Last night's meal will probaby be the last of our "completely home grown" roast dinners for a few weeks. Once that new cloche had been replaced, I sowed a row of Cherry Belle radishes. 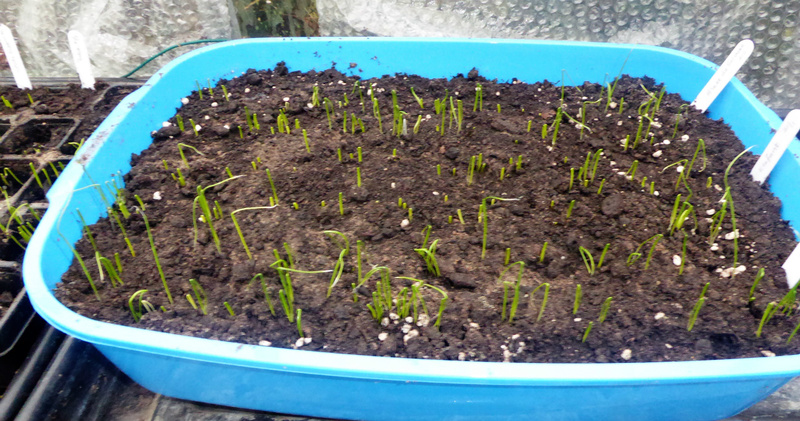 It feels warm enough for them to germinate, but am waiting to see how quickly they come up before sowing anything else. These performed well early in the season last year, as you can see here, so fingers crossed they do the same again. 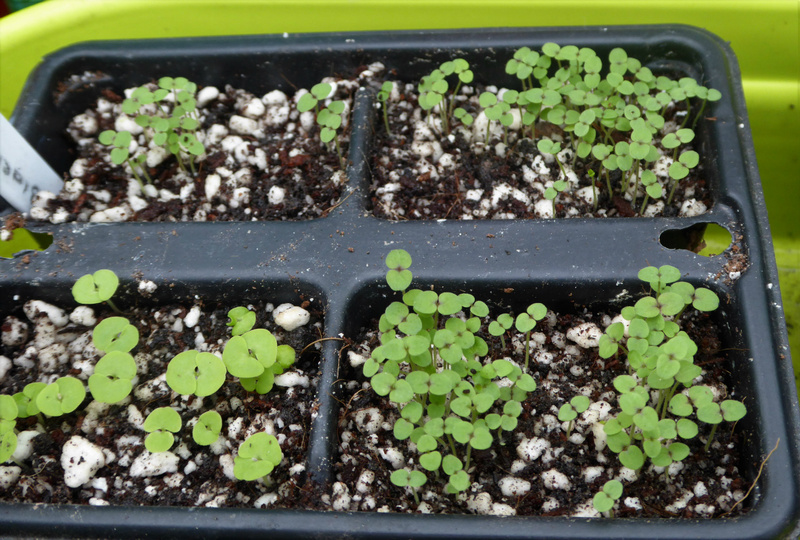 The flower seedling are growing: French marigolds in individual modules are all up, but the self saved seed from those large Indian Marigolds havn'e germinated at all. They were sown on 15th, so I'll give them another few days, but if they are not up by Wednesday I shall buy some seeds of tall African Marigolds to use instead. 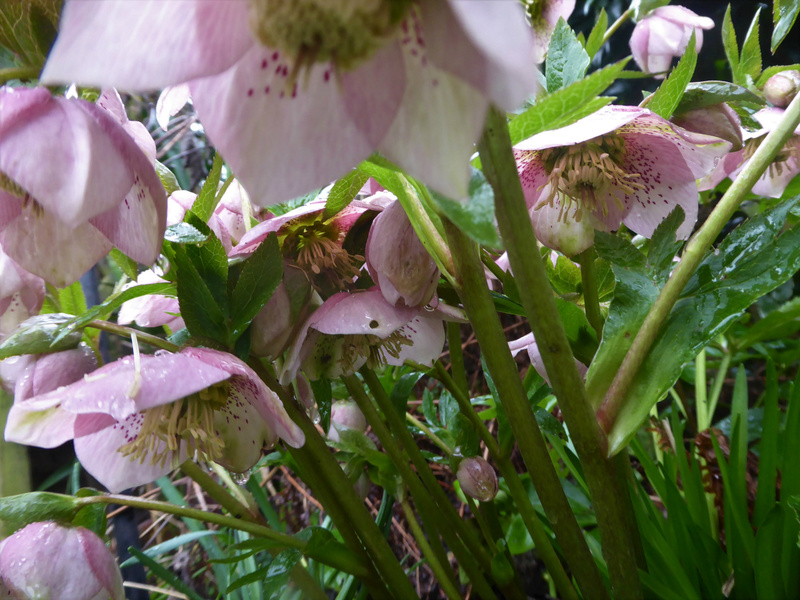 Out in the garden, flowers are slowly unfurling and there are splashes of colour in every corner, so, to end this week's blog, I thought you might like to see some of them. Notice the lack of crocuses: the large purple ones are filling the corner of the lawn now, but it is raining and they are all tightly closed. When the sunshines again I shall take a photo to share next week, as they are such a gorgeous sight. Thank you for reading all this right to the end! 20th February: Last week was A Little Bit of Sunshine's first birthday!!! 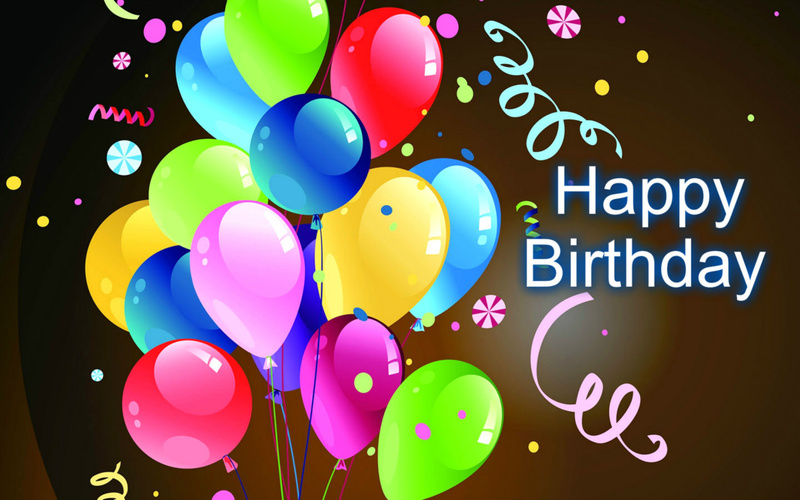 Time has just flown since my initial tentative foray into the world of blogging and I would like to thank all of you who have shared my posts over the last year .... over 43,000 times! for all your support and encouragement, messages, questions and comments. I really appreciate them all!! This has been a busy week, with seeds popping up all over the place! The chillies and aubergines sown last week in the propagator are germinating now, and some are nearly ready to be moved down to the greenhouse, where the light is better than on the kitchen windowsill. The greenhouse is already packed solid, with modular trays of Red Epicure Broad Beans and Wizard Field Beans, Sweet Peas, Sweet William, Indian Marigolds and French Marigolds joining the onions and leeks. The French Marigold seeds were up in just five days, which is amazing. There is only one seed per module, so I hope this gives them plenty of growing space. The Antirrhinums were in the propagator, and now that the teeny tiny seedlings are up, they are in the greenhouse under a cloche to help them acclimatise. You can just see them bottom left in this photo. There is space for three more of the small trays from the propagator to move down there, and I have a second one of these lime green tray sets, so all I need to do is find somewhere to put it when the chillies are moved. 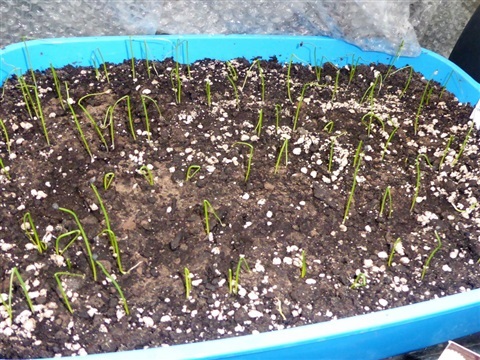 Onion sets can be moved to the dining room table temporarily until their beds at the allotment are uncovered and lightly dug over, so that might be the answer! 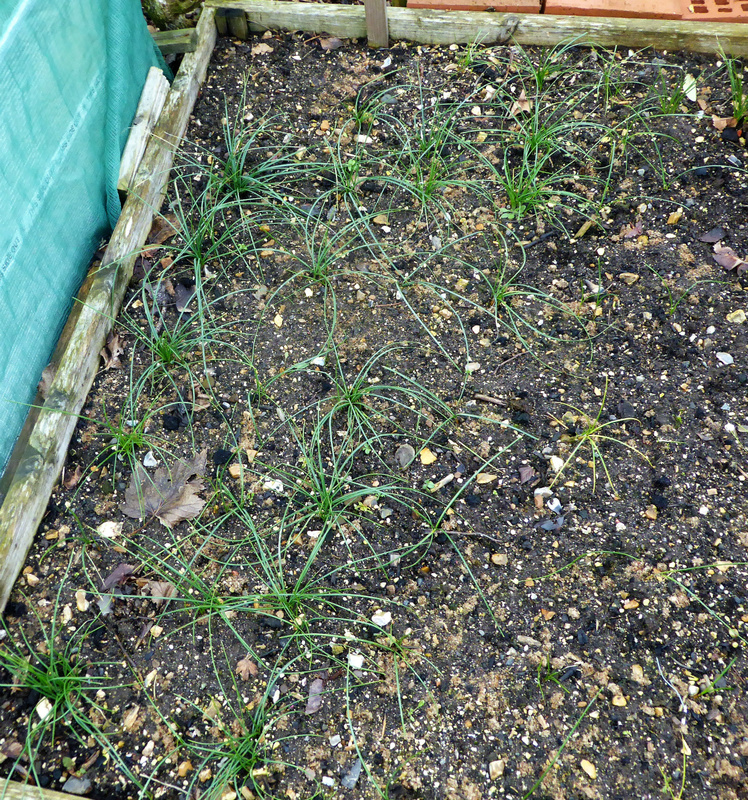 As you can see, the leeks and onions grown from seed are doing well, and I expect to start hardening off the leeks soon so that they can move out into the garden, in the slight shelter of covered seating area. One big juggling act! The other side of the greenhouse is currently housing seed potatoes chitting in egg boxes. Our daughter bought me some at the Hampshire Potato Day as a birthday present (mine, not the Blog's) and the order from JBA has arrived. This year we have a small number of several that are new to us, to try them out before committing a whole lot of space to something we haven't tasted. Our old favourites though will give us the bulk of the crop. I'll certainly need to label the rows well, with labels that don't get buried as the plants are earthed up, or fade so they can't be read by harvest time. I'll grow a few single tubers in bags too. Small bags, as apparently this works better than say three tubers in a large bag. I do remember growing potatoes in buckets with the children years back, and getting a good return, so there might be some sense in this. Be nice to have some very early new potatoes, so I'll get at least one Charlotte in tomorrow. The weather this week has been unseasonably mild, and I have been able to get to work at the plot, preparing for some sowing. I treated myself to a new cloche, 3m by 1m and 80 cm tall, aiming to get some early crops underway as soon as the ground is warmed up... beetroot, salad leaves, carrots and radishes in small quantities will be a good start I think. 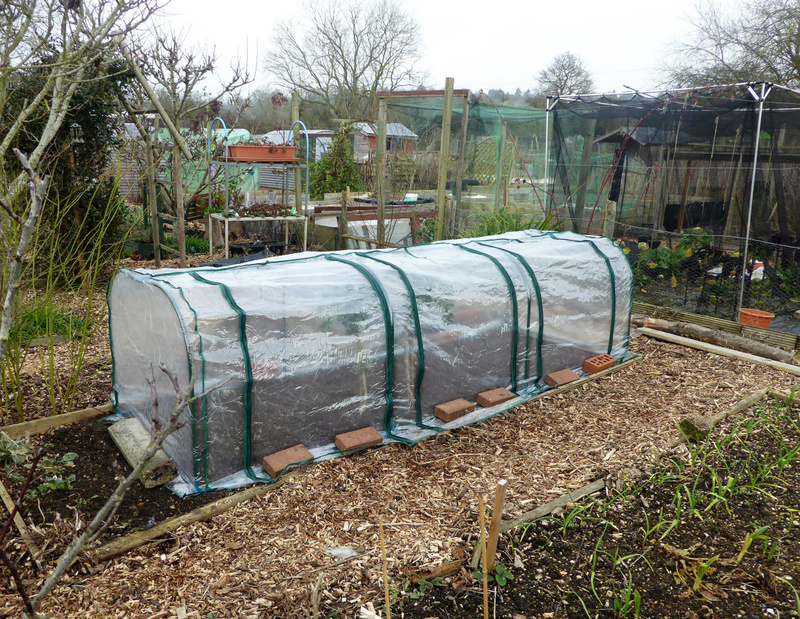 The frame will be useful as a support for netting over cabbages later in the season too, once the plastic cover is no longer needed. The frame is weighted down with concrete capping stones and the cover held securely with bricks, which I hope will be sufficient to stop it blowing away. Red Mustard is growing well in the mini-tunnel, and this picking went into a dish of spicy meatballs ...delicious! The biggest job this week has been weeding the 14m by 2m fruit bed, pruning the gooseberry bushes and Autumn raspberries. neither cropped well last year, and so they have had an extra feed this Spring to encourage them along a bit. I shall also mulch then with rotted manure before a new top dressing of chipped wood, which should help with water retention. I found out the hard way that you really should pick up gooseberry bush prunings as you go, and not leave them lying there to lacerate your hands through your gloves when weeding. Ouch! And why I always manage to get stabbed in the head when I am pruning gooseberries I do not know. It's a job I put off as long as possible, but now it is done for another year, thank goodness. And I picked up every one of the prunings this time too! Four years back we planted a Braeburn apple tree, bought as it is Abi's favourite apple. 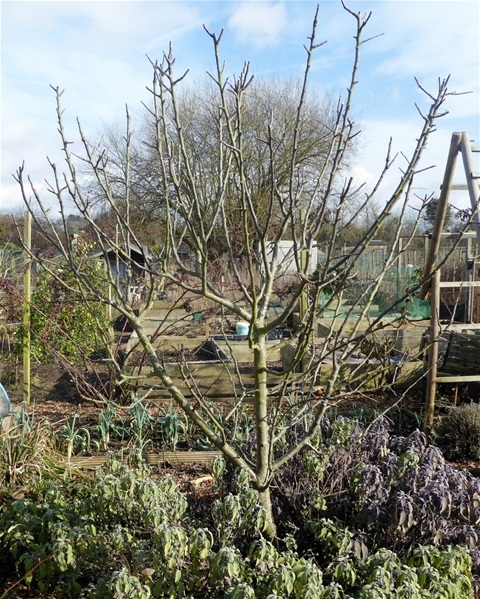 I was a bit unsure whether it produced fruiting buds on spurs or on the tips of branches, so wasn't sure how to prune it. Advice from "those who know" was to let it be and see what happened. Hmmmmm. It has grown into a large tree, blocking access to one of the flower beds, and never producing so much as a single flower. We decided that if it didn't flower this Spring it was coming out. Obviously it responded well to this threat as it now has lots of fruit buds (on spurs). That's a good start! I set to with a Winter prune to get rid of some crossing branches and reduce the height a bit. I don't want it to throw up masses of water-shoots so I was a bit cautious, but as you can see it is not a bad shape now. I can aslo walk past without a struggle, thank goodness. At home in the garden, Abi has given the lawns their first cut of the year, and just for once they look quite good rather than being all muddy. 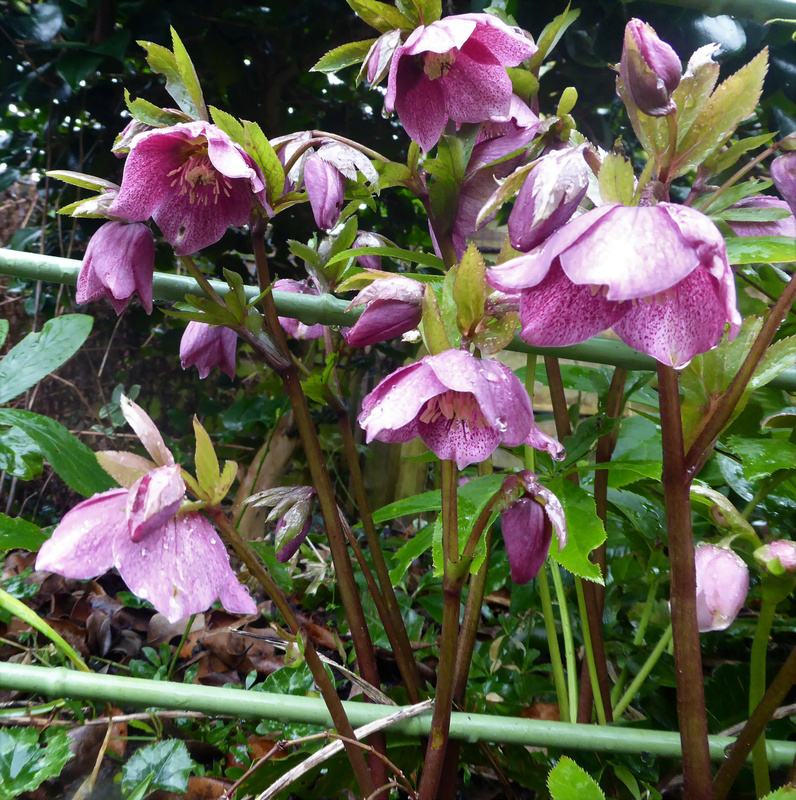 I spent a few hours cutting back last year's growth on the ferns and hellebores, which means we can see the snowdrops more easily. I have not had much success with snowdrops before, but there are a few that seem to be surviving, so I hope they multiply. 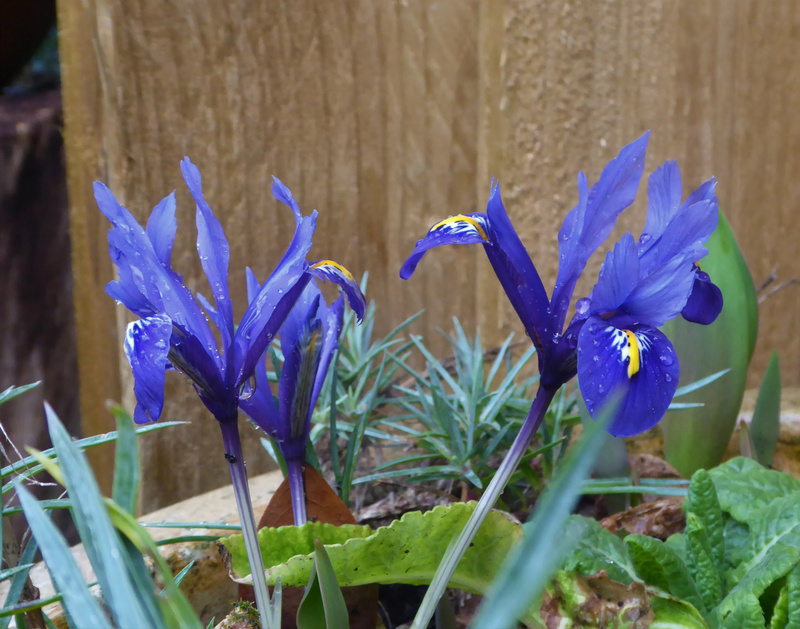 Alongside the greenhouse there is a section of lawn planted with crocuses: early yellow ones flower first, followed by little wild lilac ones, and then the huge purple blooms of a cultivated variety. 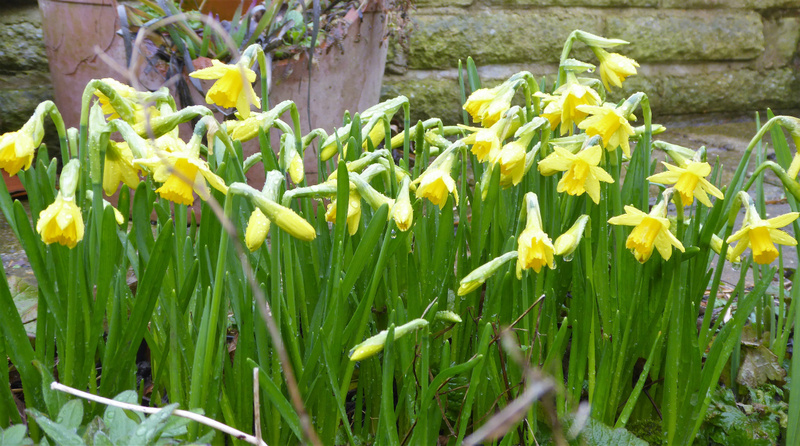 So, to finish this week, here are some of the yellow ones: a sight for sore eyes at the end of the Winter. Today I noticed lots of the little lilac ones too, as well as a couple of cream ones with dark outsides to their petals I have never noticed before. Early bees enjoy them all! 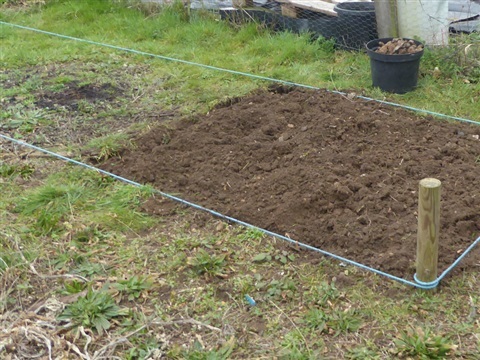 Next week I shall be working hard at the plot to get beds ready for planting, and sowing some early peas and mangetout to grow on under cover. 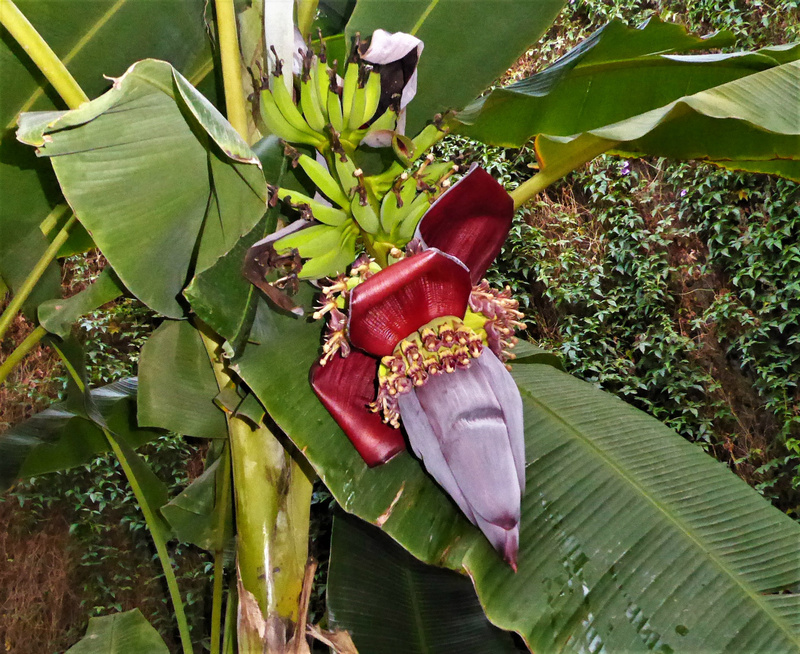 No, not from our allotment, or even our greenhouse, but a banana flower outside our door in Ranthambore, India. 13th February - Allotments back on the radar!! Hello again. We are back after three weeks in India and the snow flurries and subzero temperatures were certainly a shock to the system alright. We had a wonderful holiday, planned as a celebration of our forty years of marriage and it was wonderful... "Postcards from India" will be added as a separate page very soon, so you can share some of the sights if you'd like to. We saw so many different crops growing during our long journey, including lots of spices: I'd never seen a cardamom plant and to see huge plantations was just amazing, although I don't think I could keep even one plant alive here in England!! 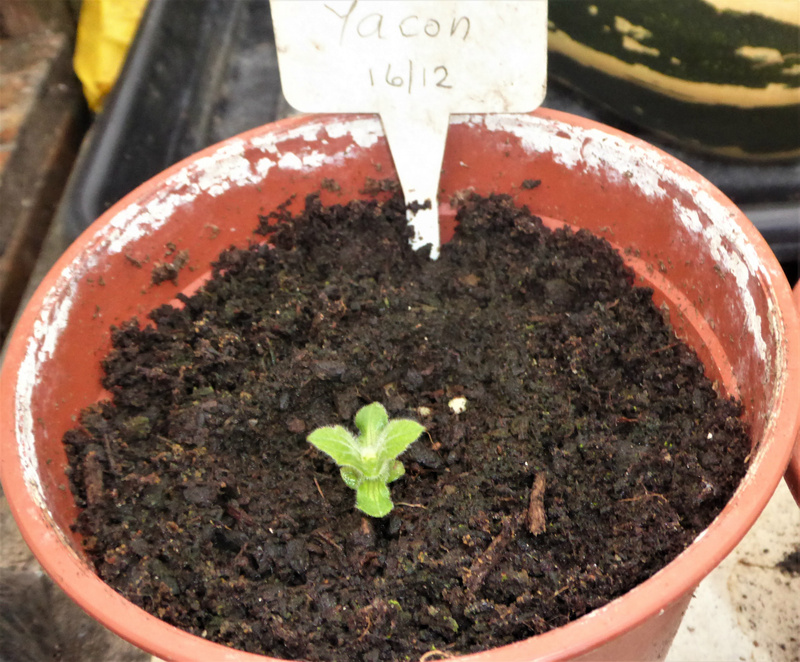 The Yacon tubers planted back in mid December are showing some growth above soil level. It is hard to believe these should be going to grow so huge, but at least they are visible now! I am trying to keep them on the dryish side because I don't want them to rot. The temperature in the greenhouse at nights falls to about 5°C and I just hope that suits them. 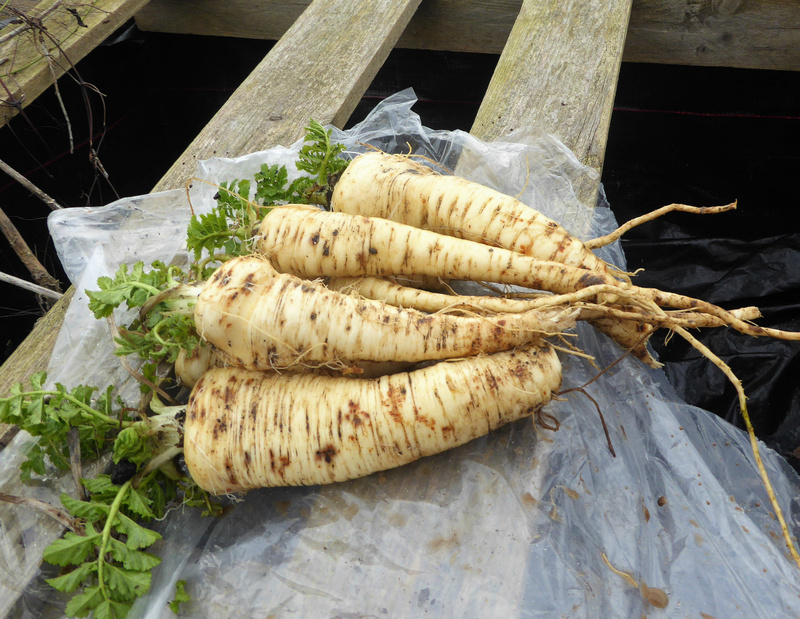 I am still keen on the idea of making syrup from the tubers eventually, so watch this space! I had a vision of that sticky, gooey session making green figs in rose syrup last year .... hmmmm, note to self: Keep hot syrup off the cooker top as it sets solid and is horrible to clear up! Yesterday, despite the bitter cold, we went off down to the plots to see how they had fared in our absence: not too bad really. 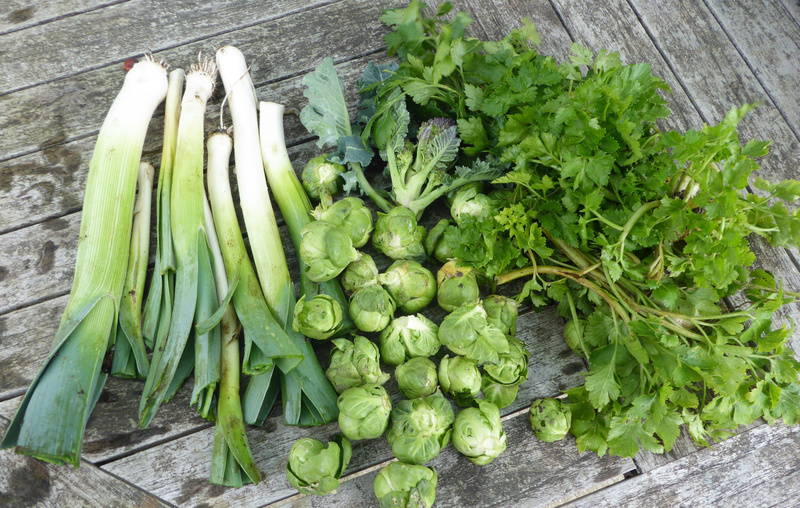 There is some tidying up needed around the brassicas to remove fallen leaves, but there is a decent picking of Brussel Sprouts to come, and the Purple Sprouting Broccoli is growing nicely... no purple shoots yet as it is a bit early still. 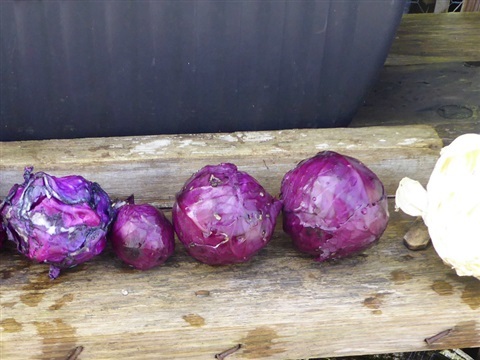 The remaining red cabbages looked a bit the worse for wear and i am not sure what they might be like inside. I'll take them up soon in case they are useable. Hope so, but if not, they will be consigned to the compost bin. 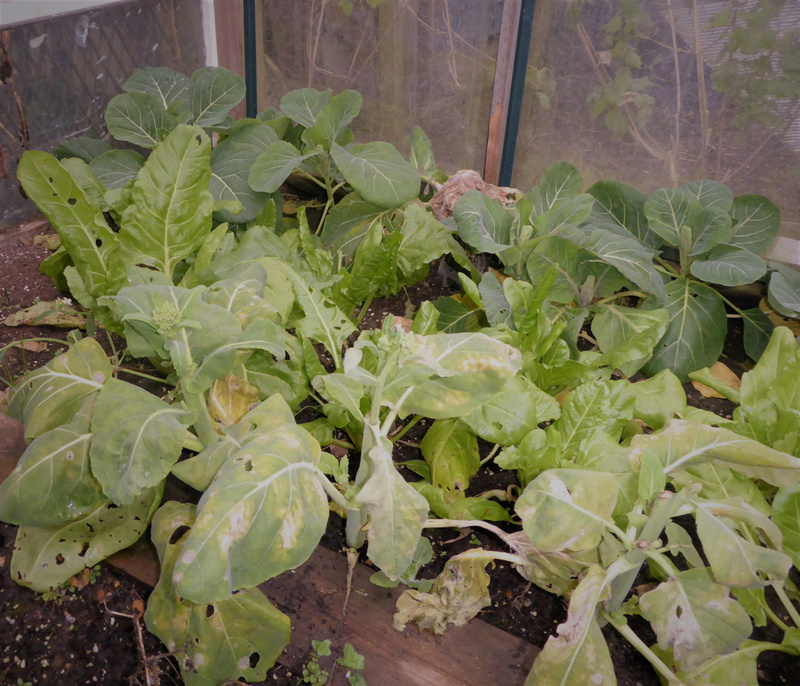 The slight protection given by the giant cloche (despite the holey nature of the lid now) has certainly paid off though, and the Spring Cabbages, Perpetual Spinach and Kailaan are looking healthy, despite a few slug holes and some sun scorch. Once the dead leaves are removed they will look more promising! They will need a decent feed soon, so checked on supplies of Blood Fish & Bone: OK for now. The plan is to eat alternate cabbage plants and then allow the others to grow a little larger. 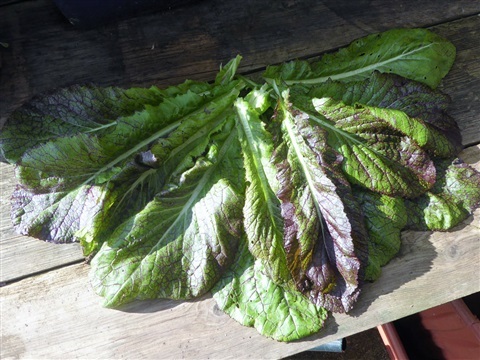 By the time the space is needed for this to act as a cold frame, the cabbages and Kailaan should be finished, which will give the spinach plenty of space, and the trays of plants being hardened off can stand on any empty ground. Said quickly, it seems a good plan, but who knows how it might go! The garlic is still growing away and I was really pleased to see that 20 out of 21 Elephant garlics have their heads above ground now too. I was beginning to wonder what was going on down there to be honest! 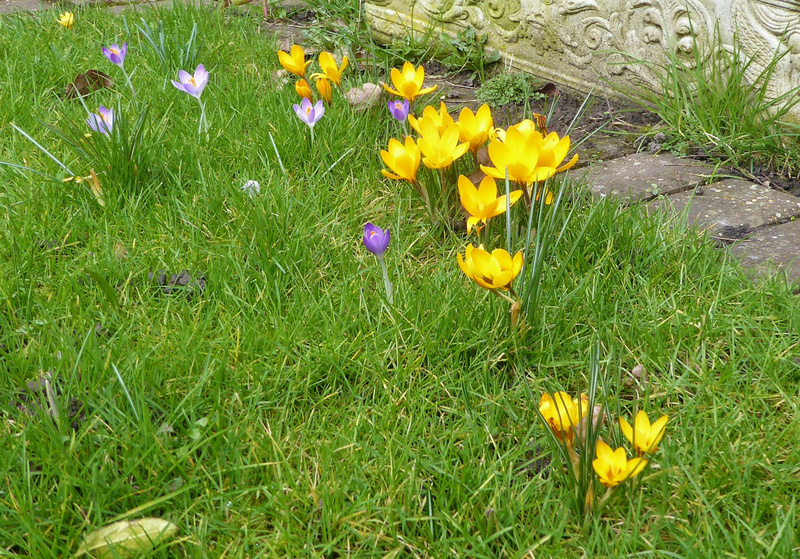 It was gratifying to see the Saffron Crocus plants though. The chicken manure pellet feed they had a month back obviously did them good, as just look at those healthy leaves, completely unscathed by cold or wet! We had five flowering corms last Autumn, and it looks as though we could at least double that this year, all being well. They were all tiny baby corms in Spring last year when they were planted, so very happy with their progress. The propagator was dusted off yesterday and installed on the windowsill, where it will live for the next four months. First customers are the Aubergines and Chillies, sown in a three part mix of perlite, coir and seed compost. This gives a nice light medium that also retains sufficient water. 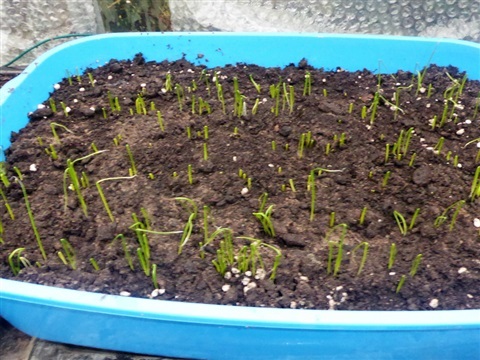 There are few nutrients, but they seedlings will be transplanted when small to ensure they can keep growing healthily. As you can see, I use a cheap additional propagator tray with five, four-hole modules covered with a transparent plastic lid. (Cost £1.99 from B&M) These modules can hold up to eight seedlings easily, giving enough space for their roots in the first stages of growth, and can be removed from the heated tray once the seeds ahve germinated so they can be grown on in cooler conditions with further modules pressed into use for the next sowings. I have made a reflector to stand in front to increase availabel light too. Cheap but effective: foil covered cardboard. Not a very hi-tec system but it seems to work!! Oh and short labels fit under the lid better than those long ones I've found. 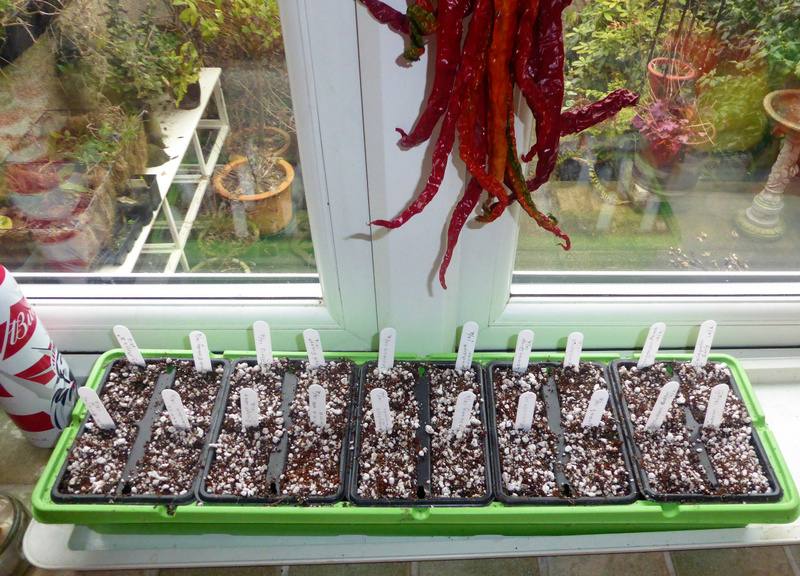 Last month I listed the chillies we are aiming to grow this year, and these are now duly sown and in the covered heated propagator. 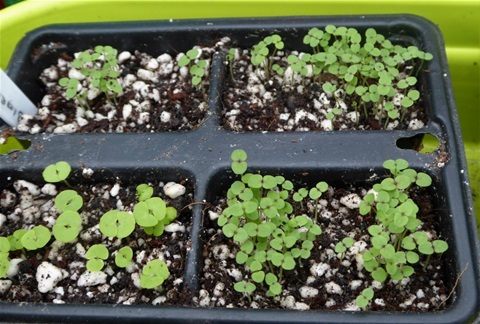 They should germinate with the next two weeks, and will be pricked out into individual pots as soon as they are showing a true leaf, rather than only the two seedling cotyledon first leaves. As I started with a banana flower, I thought you might like to see the end product on the way to market in Madurai. 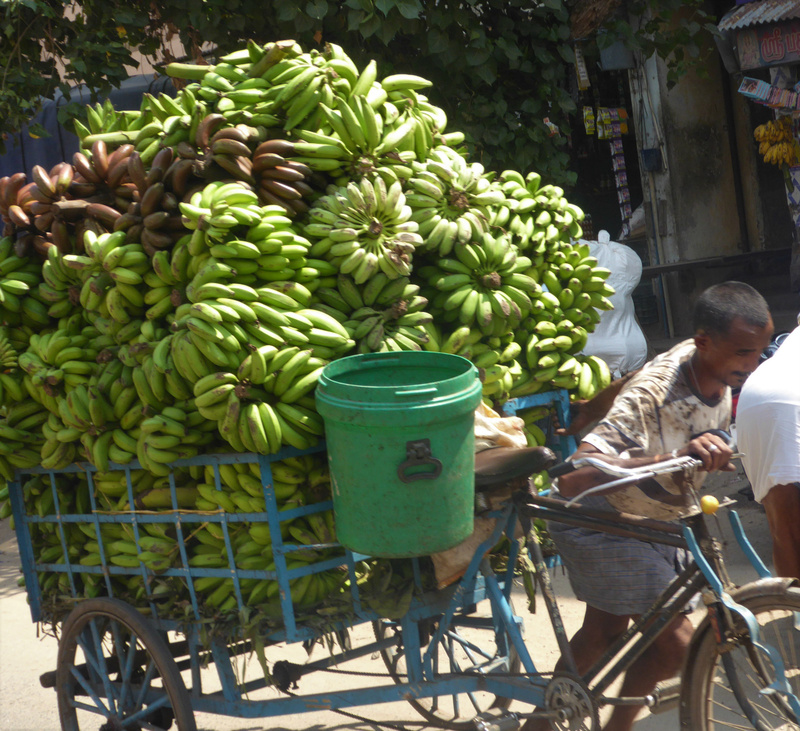 Bananas are grown in people's gardens and small farms, as well as in huge plantations. It was a real treat to eat bananas that had ripened before being picked, much sweeter and more 'banana-ey' somehow. The ones in this photo are mainly a green plantain-like banana used in cooking, with a few of a red variety. Just image the weight on this man's bicycle!! And that is where I shall end this week's blog entry. Thank you for reading it! 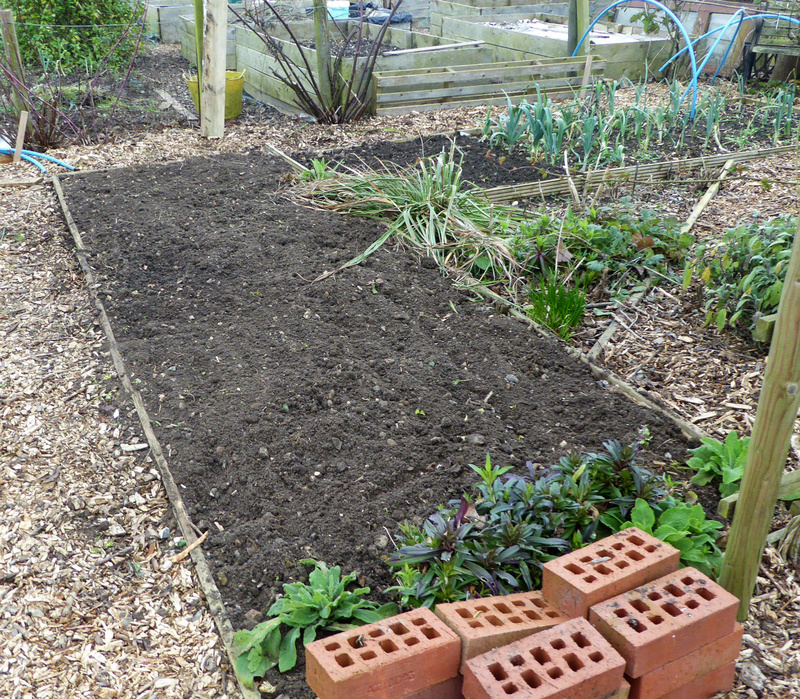 Next week I shall be moving on to Broad Beans and some flowers that benefit from being sown early. There is some milder weather forecast so maybe I can do some clearing up at the plot and harvest something too.